After a slide last week, Brent and West Texas Intermediate started the week with a modest increase thanks to an announcement from Treasury Secretary Steven Mnuchin that the trade war between the United States and China has been “put on hold” for the time being. The two, Mnuchin said, were currently working on a wider trade agreement, after the exchange of tariff threats that rattled markets earlier this year. Additional fuel for prices came from Venezuela, where incumbent president Nicolas Maduro most likely won the vote yesterday, which will prompt a reaction from the United States, and this reaction will likely target the crisis-stricken country’s main revenues source—its oil industry. Venezuela’s oil is already deep in the doldrums with production at the lowest in 70 years and still falling, and with Conoco seizing essential PDVSA assets in the Caribbean. Yet the upside potential of oil prices is limited as many industry insiders and analysts believe there is ample supply to respond to rising demand. None other than Saudi Arabia’s Energy Minister Khalid al-Falih last week told media there is no reason for Brent to go higher than US$80 as there is enough oil being produced globally to match demand. The statement was a bit puzzling as al-Falih has actively been pushing for Brent over US$80 a barrel. Shale oil production in the United States is also acting as a deterrent to prices. In the week to May 11 the average daily in the U.S. hit 10.72 million barrels largely thanks to the surge in shale production, which, according to BP’s Bob Dudley, will push oil back down to between US$50 and US$65 a barrel. OPEC stepping in to cover potential supply shortages from Iran after U.S. sanctions kick in later this year will help the downward pressure, Dudley told Reuters. In futures markets, according to the latest CFTC commitment of traders report, large speculators, defined as "Managed Money" and "Others," reduced their net long position 44,290 contracts, without "Managed Money" significantly increasing their short position, while Producers, Merchants, Processors and Users (PMP) increased their longs 12,238 contracts and reduced their shorts 26, 971 contracts for an increase to their net long position of 39,208 contracts to an unusual 50,933 contracts net long. 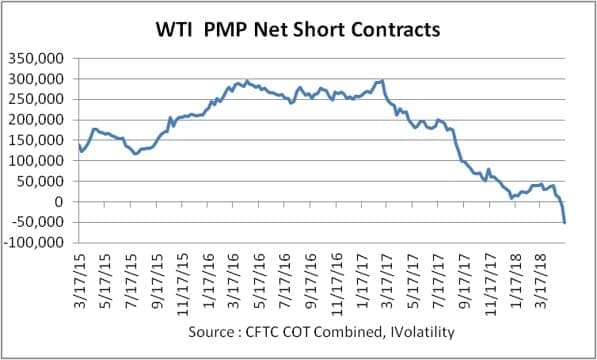 According to Jack Walker of Ivolatility, the "PMP" net position is typically net short as producers hedge production by shorting futures contracts, but this not the current situation as the chart below shows. At the time of writing, Brent crude was trading at US$79.11 a barrel, up 0.76 percent from Friday’s close, and West Texas Intermediate was at US$71.93 a barrel, up 0.78 percent. Oil prices will react positively to the announcement from US Treasury Secretary Steven Mnuchin that the trade war between the United States and China has been “put on hold” for the time being. Still, relations between the United States and China will increasingly run into trouble from time to time. The current and future state of affairs between the two titans could be portrayed truthfully by two significant statements. One is that the great rivalry between the United States and China will shape the 21st century. It is a truth universally acknowledged that a great power will never voluntarily surrender pride of place to a challenger. The United States is the pre-eminent great power. China is now its challenger. The petro-yuan will come between these two titans for many years to come. The imposition of tariffs on Chinese goods could be viewed as the first shots in the petro-yuan/petrodollar war of attrition. As for Venezuela, a possible US sanctions against its oil industry in the aftermath of the incumbent president Nicholas Maduro winning yesterday’s election will not add to the current geopolitical concerns as the global oil market has already factored in the country’s declining oil production. The Saudi oil minister, Khalid al-Falih, knows that the current fundamentals of the global oil market are positive enough to push the oil price beyond $100 a barrel. That is why he can afford to be smug about an $80 price. He is aiming to push oil prices to the highest level the global oil market can tolerate. I have already calculated that a fair oil price ranges from $100-$130. BP’s CEO Bob Dudley is wrong in assuming that rising US oil production and OPEC stepping in to cover potential supply shortage from Iran after US sanctions could push oil back to between $50 and $65. First, Iran will not lose a single barrel of oil exports as a result of the re-introduction of US sanctions against it. And second, US oil production has neither managed to stop oil prices breaking through $60 in December 2017 nor hit $80 in May this year. They will never stop oil prices going up to $85-$90 in 2019 and hitting $100 or higher in 2020.